How do we know whether there are other minds besides our own? The problem of other minds raises many questions which are at the root of all philosophical investigations - how it is we know, what is the mind and can we be certain about any of our beliefs? 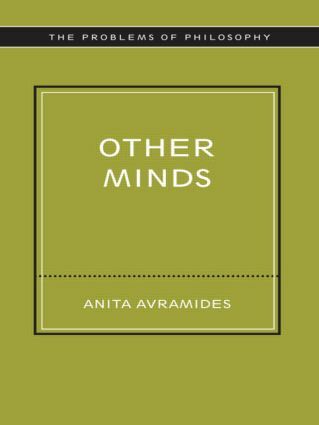 In this compelling analysis of 'other minds' Anita Avramides traces the question from the Ancient Sceptics through to Descartes, Malebranche, Locke, Berkeley, Reid and Wittgenstein. The second part of the book explores the views of influential contemporary philosophers such as Strawson, Davidson, Nagel and Searle. Other Minds provides a clear insightful introduction to one of the most important problems in philosophy. It will prove invaluable to all students of philosophy.